The Rocker Switch block toggles the value of the connected block parameter between two values during simulation. For example, you can connect the Rocker Switch block to a Switch block in your model and change its state during simulation. Use the Rocker Switch block with other Dashboard blocks to create an interactive dashboard for your model. Double-clicking the Rocker Switch block does not open its dialog box during simulation and when the block is selected. To edit the block's parameters, you can use the Property Inspector, or you can right-click the block and select Block Parameters from the context menu. Pairs of values to assign to the connected variable or parameter and text to display on the block. Switches have two states — Top and Bottom — one corresponding to each switch position. Each state contains a Value and a Label. Value — Value to assign to the connected variable or parameter when the switch is in the corresponding position. Label — Text to display on the block for the corresponding position. This table describes the default configuration for the block. Value — Scalar double value for the state. Label — String or character array to use as the label for the switch position. 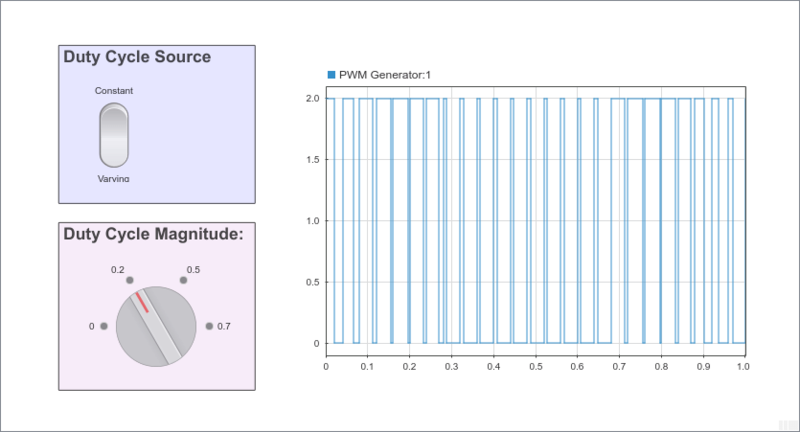 Control the generation of a PWM signal from a dashboard of controls and displays.